So first of all, our day got off to a weird start today. Shawn got a call very early in the morning from the police letting him know that the pharmacy was robbed overnight and he needed to come in and open everything up and let the police in to investigate. So he drug himself out of bed and spent three hours over there this morning going over surveillance camera footage with the police and tying to figure out what was stolen and what happened. It's an ongoing investigation so that's all I can say about that, but I think it was a very weird experience for him. They didn't know if anyone was still in the building, so he unlocked the door and the police swarmed in with weapons drawn and it was just the sort of thing that you don't normally encounter in your life unless you work for the police department. Anyway, everything will be fine, they'll figure it all out. It was just a weird event. A few years ago his pharmacy was actually robbed at gunpoint during the day, but we happened to be out of town that day, so he had that day off. Fortunately no one was hurt and they caught the guy that time. Pharmacy robberies are unfortunately all too common it seems, and he works in a quiet, safe part of town. It's scary. So that was the thing that made me UNhappy today, but now I'm here to tell you about the thing that made me happy, and it comes with a story. When I was a kid, one of my favorite times of the week was Sunday evening. We would have a Sunday night treat, usually popcorn, and pile onto my parents bed and watch the Sunday night Disney movie. I loved hanging out in my parents bedroom. We had a living room with a TV in it, so I'm not sure why we watched TV in my parents bedroom, but it's a memory I enjoy. Anyway, popcorn on Sunday afternoon has become a thing with me. It's like this habit that has carried over from my childhood. It's not a proper Sunday afternoon unless there is popcorn. And I'm a popcorn snob. No microwave popcorn for me, it must be air popped. I have come to realize recently that air popped popcorn is becoming a thing of the past. I was having a popcorn discussion with some friends recently and they all looked at me like I was nuts when I said I still use an air popper. We use ours so much we recently had to get a new one because we literally wore the last one out. The alternate acceptable method for making popcorn is the whirlypop, which is like an old fashion stove top popcorn kettle. It's absolutely delicious that way, but it's also a zillion calories and you have to buy the oil and flavoring and when we ran out last time I decided not to buy more because then I eat popcorn seven days a week and weigh two thousand pounds and my pants won't zip up and it's just not pretty when that happens. childhood and it's a sweet little thing that Shawn does for me. I know it's silly, but Sunday afternoon popcorn is a little moment of joy in my week. 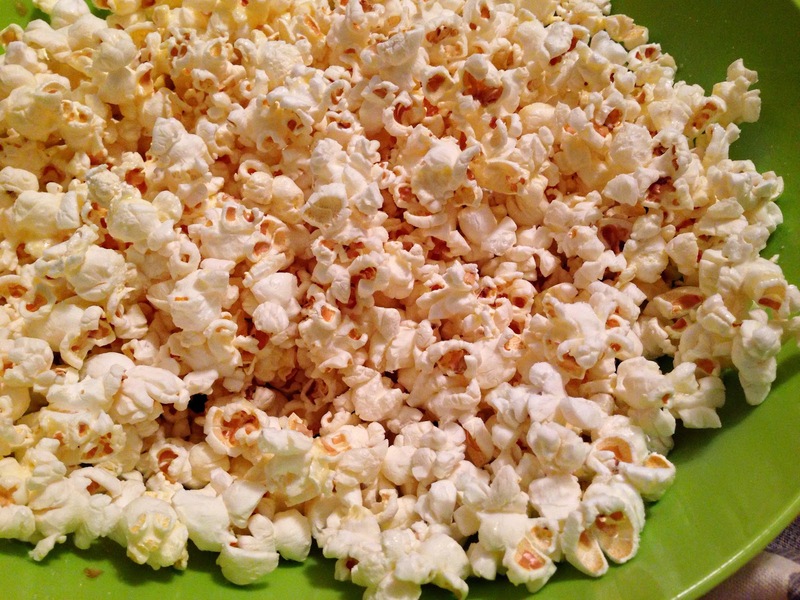 Sunday afternoon popcorn makes me happy!